One in five American adults has a mental health condition, and 56 percent of individuals do not receive treatment. Mental health problems affect relationships, careers and overall health. For example, major depressive disorder is the leading cause of disability for ages 15 to 44. Mental health issues are also associated with higher rates of cardiovascular disease, diabetes and cancer. It’s heartbreaking that so many Americans do not get the help they need. What’s stopping individuals from seeking help? Many Americans can’t afford to go to a psychologist, psychiatrist or mental health counselor. Even with insurance, mental health treatment is out of range. The Paul Wellstone and Pete Domenici Mental Health Parity and Addiction Equity Act (MHPAEA) of 2008 aims to make mental health care more affordable to insured individuals, but it hasn’t proven to be as effective as intended. If you manage a behavioral health practice, you may have experienced the advantages and disadvantages of MHPAEA. Perhaps your clinic saw a rise in patients after the act was implemented. Maybe you know the frustration and disappointment of losing clients due to a lack of coverage despite MHPAEA. Although MHPAEA has helped make some progress in the mental health field for patients and providers, it hasn’t done enough. 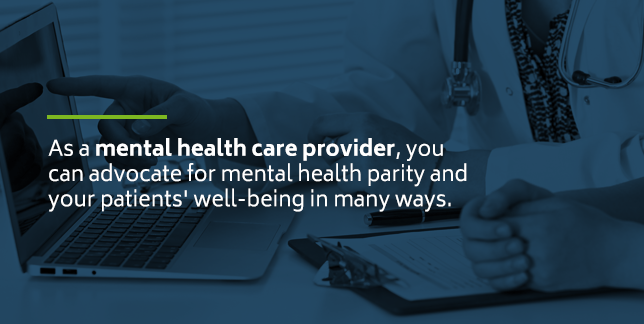 In this post, we’ll explore mental health parity laws, how insurance companies continue to discriminate despite MHPAEA and how you can be an advocate for your patients and other Americans in need of mental health treatment. 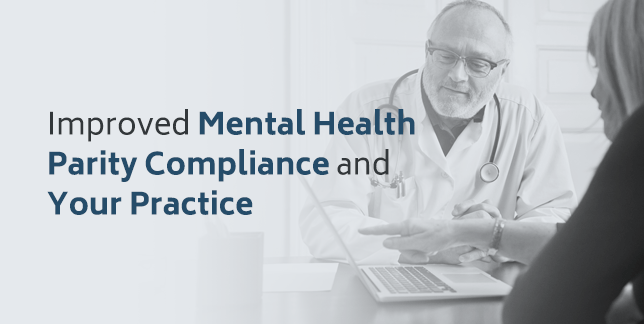 MHPAEA is a federal law that requires health insurers who offer medical and surgical benefits — as well as mental health or substance abuse disorder benefits — to not place stricter limits on mental health benefits. 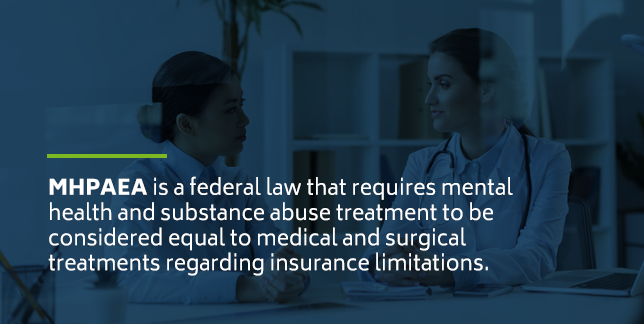 In other words, mental health and substance abuse treatment should be considered equal to medical and surgical treatments regarding insurance limitations. The Mental Health Parity Act (MHPA) of 1996, the original act, did not include substance abuse disorders and focused only on dollar limits on mental health benefits. MHPAEA is an improvement on past mental health parity laws. Unlike MHPA, MHPAEA prohibits unequal limitations outside of dollar limits, such as treatment days and deductibles. However, there are certain exceptions. For example, MHPAEA requirements do not apply to small self-insured private employers that have 50 or fewer employees. Also, health insurance issuers and group health plans are exempt from the act if it increases their costs at least 2 percent in the first year of making changes to comply with MHPAEA. MHPAEA intends to make mental health care more affordable for insured individuals, or, at least, equal to their medical benefits. With MHPA, insurers found ways to evade regulations by raising deductibles, shortening the length of treatment stays and increasing out-of-pocket costs by shrinking the number of providers in the network. MHPAEA tried to amend any loopholes but still has not been a complete success. Millions of Americans remain without the mental health treatment and medication they need — largely because they still cannot afford deductibles or find providers in their network. In 2013, researchers estimated that the combination of MHPAEA and the Affordable Care Act (ACA) would help expand mental health and substance abuse disorder benefits for 62 million Americans. However, millions continue to face steep deductibles and inadequate coverage. MHPAEA has not been able to stop discrimination. Insurance companies deny mental health treatment coverage or complicate the process by deeming a condition medically unnecessary. They commonly deny residential treatment services, diagnostic assessments and intermediate level care, such as partial hospitalization. This leaves a lot of individuals without help for substance abuse disorders. Many insurance companies try to keep mental health and substance abuse disorders separate from medical issues, but who is to determine what is medically necessary? 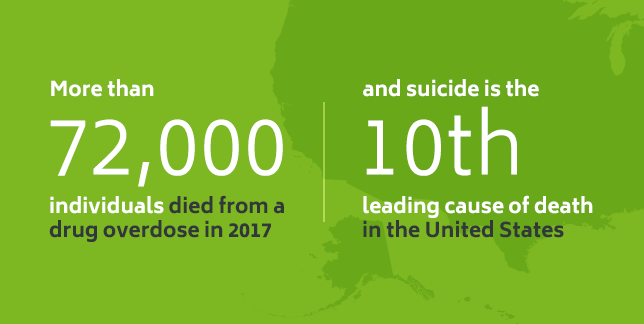 Considering more than 72,000 individuals died from a drug overdose in 2017 — and suicide is the tenth leading cause of death in the United States — it seems fair to say mental health services are a medical necessity. Between 2013 and 2015, the proportion of inpatient services for behavioral health care provided by out-of-network providers was 2.8 to 4.2 times higher than medical or surgical services. The proportion of out-of-network outpatient behavioral health services was 3 to 5.8 times higher than medical or surgical services. The proportion of out-of-network behavioral health office visits was 4.8 to 5.1 times higher than medical or surgical care office visits. When patients use out-of-network providers, they often have to pay more than they can afford. For example, one patient says her therapist stopped accepting her insurance, which used to include a co-payment of $25 a week. Since then, her rate jumped to $110 per session and she had to stop going, saying she couldn’t afford it and had to choose groceries over therapy. A lack of mental health parity in insurance not only affects patients, but it also has a negative impact on behavioral health clinics. As you’ll see below, insurance discrimination presents many challenges to professionals in the mental health field, such as these four. Many insurance companies have not increased the reimbursement rates for psychologists in decades, despite rising administrative costs. Some companies have cut reimbursement rates. For this reason, many clinics avoid participating in certain insurance networks, and it puts practices in a difficult position. On the one hand, behavioral health clinics want to help patients who need care. On the other hand, they need to be able to run their practice. Psychiatrists are part of this impact. For example, a national survey found psychiatrists accept all types of insurance at a much lower rate than other specialties. However, the study was limited in finding out why this is the case. As mentioned above, when mental health practices are out-of-network, it makes it much more difficult for patients to find affordable care. Although some insurance companies reimburse for out-of-network care, patients typically have to pay higher out-of-pocket costs. In some cases, patients may have to spend hundreds or thousands of dollars in deductibles before their insurance company makes any payments. Or, they may have to drive long distances to see a provider who is in their network. When behavioral health care isn’t convenient or affordable, patients stop going to therapy sessions. One out of five adults with mental health issues does not get the treatment they need because they lack funds or adequate insurance, or due to a lack of available providers. It is difficult for practices to grow when they lose clients or can’t attract new ones. Mental health care should not be separate from medical or surgical health care. When an insurance company denies a client mental health care or finds other ways to discriminate against an individual in need of treatment, they reinforce the stigma attached to mental health issues and substance abuse disorders. Around 29 percent of Americans claim they are embarrassed to talk about their mental health issue. When insurance companies claim mental health treatment is medically unnecessary, they are promoting the idea that mental health issues are not real conditions. Individuals might question the significance of their mental health problem as a result and deny themselves the attention they deserve. 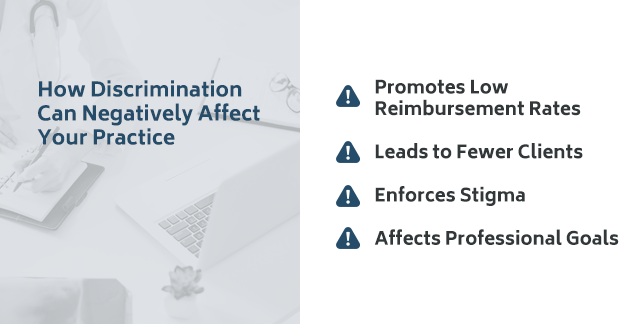 Insurance discrimination also reinforces stigma within a behavioral health practice. Mental health counselors also need support and should not feel embarrassed to seek help. As a behavioral health professional, you likely invested a lot of time and money in obtaining a degree. You probably have a passion for helping people and want to advance in your field. When insurance companies discriminate against your clients, and clients stop seeing you, you miss the opportunity to use your talents and knowledge to help clients as much as possible. Nevertheless, there is hope to make a positive impact despite the issues and confusion surrounding insurance policies and mental health parity laws. Let’s look at how you can be an advocate for patients and fight for mental health parity. Inform Patients of Their Rights: In 2014, 90 percent of Americans were unfamiliar with mental health parity laws. Help educate patients about their rights any way you can. For example, you might hang a poster in your clinic created by the American Psychiatric Association (APA) which explains the law and tells patients what to do if they feel it has been violated. Become an Advocate Through the APA: The APA is involved in advocacy efforts around the country. APA members can join the APA political action committee (PAC) to support candidates who are dedicated to improving the health of an individual with mental health disorders. You can also visit the APA Advocacy Action Center to get involved or build a relationship with legislators through the Congressional Advocacy Network. Join NAMI: NAMI advocates for a range of issues, including a lack of mental health parity. Join NAMI to write to legislators and use their strong presence to be heard. Aim to Educate: Equip yourself, your patients and your staff with as much knowledge as possible. Know legislators who have a personal connection to mental health and substance abuse disorders, and use their stories to promote improvements to the law. Learn your state’s legislative process. The more you know, the more prepared you’ll be to make a difference. Help Patients Report Discrimination: Some patients may not know how to report or recognize discrimination. Although hanging a poster in your clinic can be helpful, sometimes you have to step in. We’ll show you how to report a violation below. It’s estimated that untreated behavioral health issues cost society between $150 and $200 billion a year. In other words, it costs more not to treat individuals with mental health or substance abuse issues than it does to help them. Identify the Type of Insurance Coverage: The client will choose the type of coverage they have and whether it is an insurance plan purchased by employers or individuals, a self-funded plan or insurance through the state or local government. Use a Template to Complete the Complaint Letter: The client will complete their complaint letter using the appropriate template. Submit: After they complete their complaint letter, they will submit the letter to the responsible agency. Non-members can report an issue to the Parity Implementation Coalition. Mental health is critical to realizing one’s potential and enjoying overall well-being, and it’s proven that mental health treatment works. Behavioral health treatment helps many individuals gain the strength and insight they need to change negative behaviors and thinking patterns. All Americans deserve access to affordable mental health care. As a behavioral health professional, you should be able to help your clients and run your practice without overwhelming financial concerns. Parity ensures mental health is treated as it should be — a genuine health concern. ICANotes is here to help support you and your clients. 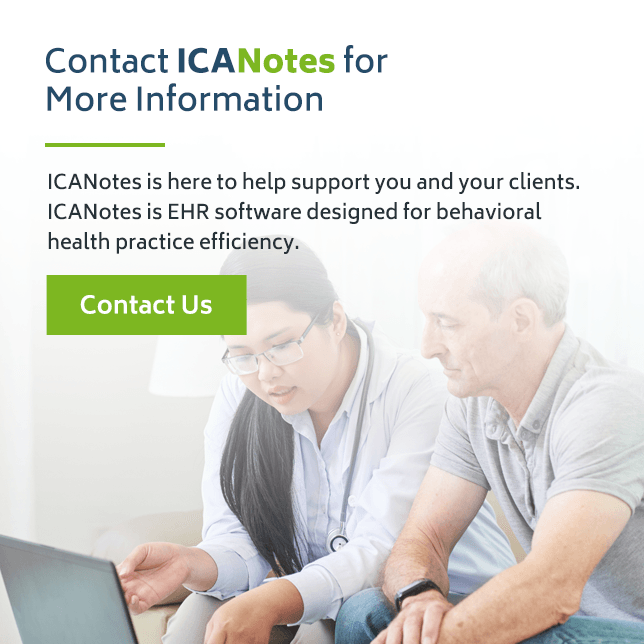 ICANotes is EHR software designed for behavioral health practice efficiency. ICANotes makes mental health care more accessible for patients and providers with documentation and billing features that are easy to use, accurate and secure. Most importantly, ICANotes helps remove the burden of administrative tasks, so you can focus on your clients. To learn more about ICANotes and how we can help your practice provide better patient care, contact us today.